Bhendi Bazaar is a market in South Mumbai. The origin of the name is that the British residing to the south of Crawford Market in Fort, referred to this area to the north of Crawford Market as "Behind the Bazaar". The natives picked this as "Bhendi Bazaar". Bhendi Bazaar occupied an area between Mohammed Ali Road and Khetwadi. Mini Kerala in Mumbai. 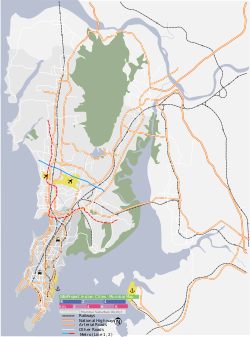 The closest Central and Harbour railway station is Sandhurst Road, and the closest Western railway stations are Charni Road and Grant Road. The bazaar is popular for shopping viz antique items, hardware items. There are other markets surrounding Bhendi Bazaar such as Crawford Market (Phule Market), Chor Bazaar, Nul Bazaar, and other small markets. Bhendi Bazaar is primarily a Muslim-populated area, home to Muslims with origins in all parts of India, especially Maharashtra, Gujarat, Kerala and the Northern states. Shop-owners and hawkers in this market belong to different religious groups. The area also houses Raudat Tahera, the mausoleum of the 51st and 52nd Dai-al-Mutlaq of the Dawoodi Bohras, Syedna Taher Saifuddin and Syedna Mohammed Burhanuddin. It is also home to the popular Bhendibazaar gharana of Hindustani classical music. The area is set to be revamped soon with the project being undertaken by Saifee Burhani Upliftment Trust initiated by Dr Syedna Mohammed Burhanuddin, head of the Dawoodi Bohra community. During the British Raj Bhendi Bazaar was built as the Labor Camp for the workers to stay who were engaged in the Development of The Mumbai City, Later when the Work Accomplished the buildings were sold to the private owners and they in return accommodate the tenants on Paghdi System. the Old Streets Like Saifee Jubilee Street, Khara Tank Road, Dhabu Street now called Raudat Tahera Street, Pakmodia Street, Zainabia Marg, Tokra Gulli, 1st Cooper Street, 2nd Cooper Street, 3rd Cooper Street, and Chor Bazaar Consist of Mutton Street,Chimna Butcher street. All Streets Occupied with the Migrants from Gujarat, Maharashtra, Rajasthan and Madhya Pradesh belonged to the Dawoodi Bohra Community and Other Muslim Sects. A 2010 Bollywood film, Bhindi Baazaar is set in the area. Tabriz Bazaar, Tabriz, Iran: the largest covered bazaar in the world. ^ Dhaneshwar, Amarendra (19 April 2011). "Big on Bhendi bazaar". The Times of India. Mumbai Mirror. Retrieved 7 June 2012. ^ Suryawanshi, Sudhir (9 July 2011)Mumbai's Bhendi Bazaar set for a Rs2,000 crore makeover DNA India. Retrieved 7 June 2012. ^ Mehta, Rajshri. (7 July 2011) Massive revamp of Bhendi Bazaar gets CM's nod The Times of India. Retrieved 7 June 2012. This page was last edited on 27 March 2019, at 16:15 (UTC).